Copper Connectors - Holme Dodsworth Metals Ltd.
We are able to produce high quality round cables for construction purposes with cross sectional areas of between 0.5mm2 to 1000mm2. Finishes can be either tinned or natural and we are able to supply with a wide choice of end terminations. 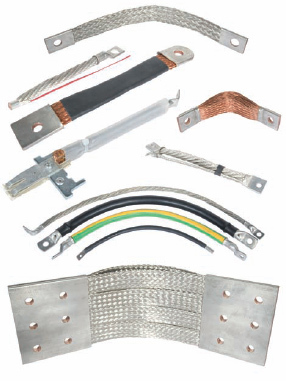 Braided copper connectors consist of braided strands of wires woven together to produce a flexible electrical connection between large components. Because they are manufactured using multiple lengths of copper wire these connectors have a superior resistance to breakage after repeated movement or vibration compared to heavy duty cable. We supply Copper Braid flat-stranded connectors to a high specification with cross sectional sizes ranging from 4mm2 to 1500mm2 and up to 3000 amps. All connectors have ferruled ends and are available at any length. We also stock a large range of special connectors. Copper laminated flexible connectors are produced by creating layers of electrolytic copper foil which is then subjected to a high current whilst under pressure. The copper melts to form homogenous bonds and the result is a connector which has extremely low voltage drop. This allows much larger currents to be carried with a comparatively low temperature rise. 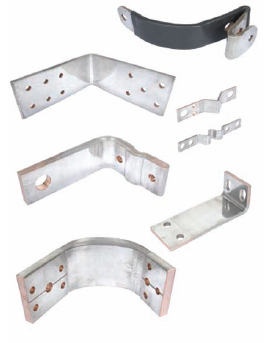 Copper laminated connectors provide a flexible alternative to solid busbars and are ideal for situations where space restriction, alignment or heat expansion may be a problem. Holme Dodsworth is able to meet your precise size, length, shape or end type specification and our expert team are able to advise you on the best solution for your application at an early stage of the project. To discuss your individual requirement contact your local branch.